Over 400,000 children in the United States are bitten by dogs each year according to the American Veterinary Medical Association. The majority of dog bites involving young children happen in familiar environments with dogs they know. Many people report that these bites seem to come “out of the blue”, that the dog just snapped without any warning. The reality is that there are many factors that lead up to dog bites. And that many of these bites could have been prevented through awareness, supervision, and education of parents and children with SAFE. Most dogs do give warning signs of their stress and discomfort, and most people are simply unaware of these signals or ignore them. Learning to read a dog’s body language and becoming more aware of their stress levels when they are interacting with children can help diffuse situations before bites occur. Perhaps there’s no greater prevention for dog bites than active, adult supervision. In many cases, adults were not providing adequate supervision when bites occurred. If there is not an adult actively supervising children and dogs, barriers, such as baby gates, can be helpful management tools in our busy multi-tasking world. With parental supervision, kids can learn smart ways of interacting with dogs using the skills taught in SAFE, such as gently petting instead of hugging and kissing, respecting the dog’s space during mealtimes and when sleeping, and not treating the dog like an object or toy. 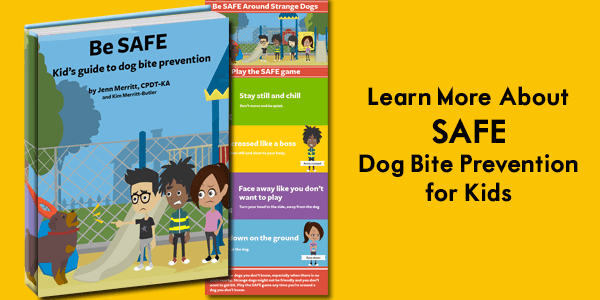 SAFE helps children develop skills that not only promotes dog bite prevention, but builds a relationship between your children and dogs based on trust and cooperation. Dog bites are scary, but dog bite prevention doesn’t have to be. It’s important to have a conversation with your children about how to stay safe around all dogs. 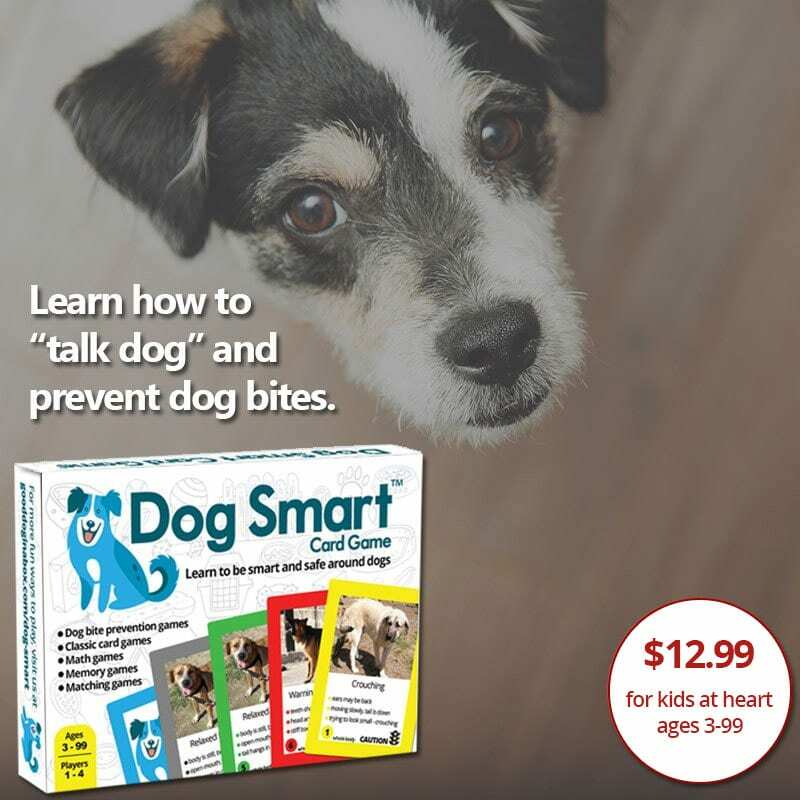 Our SAFE program gives you fun materials that you can use to teach your children how to be smart around dogs and prevent dog bites. One of the most important aspects of dog bite prevention is teaching children that they should never hug or kiss a dog, even a dog they know. Young children learn that hugging is a way of showing affection and it is only natural that they would want to hug their dog. The problem is that for dogs, hugging does not feel comfortable and being hugged can make many dogs feel trapped. This is one of the reasons why many children bitten by dogs suffer bites to the face and neck. Even if your family dog tolerates hugs, that doesn’t mean every other dog your child encounters will. Teaching children appropriate and safe behaviors starts with your own dog. 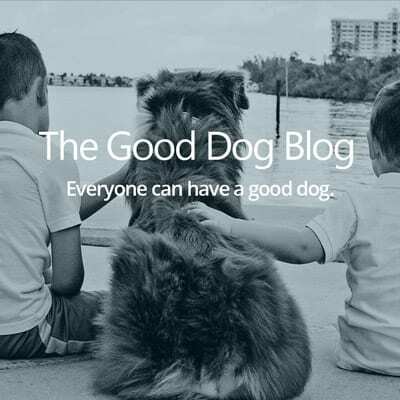 Learning to respect the dog’s body and space are good places to start. With parental supervision, kids can learn safe ways of showing dogs affection such as gently petting instead of hugging and kissing. 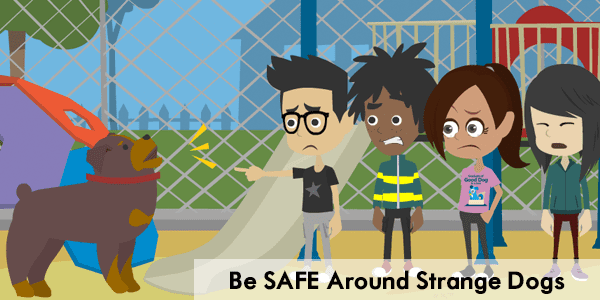 This is a smart activity and one that promotes being SAFE together. Pat the dog gently on their chest and side. Children and adults usually make a beeline for the dog’s head. Many dogs find having their head touched uncomfortable and invasive. The dog’s chest and side are more neutral areas that many dogs are more comfortable with. After a brief period of gentle petting or other interaction stop. Stop play or petting and see what the dog chooses to do. If they have had enough and walk away, it’s OK. Allow them to have a break if they need it. Don’t bother your dog when they are eating or sleeping. 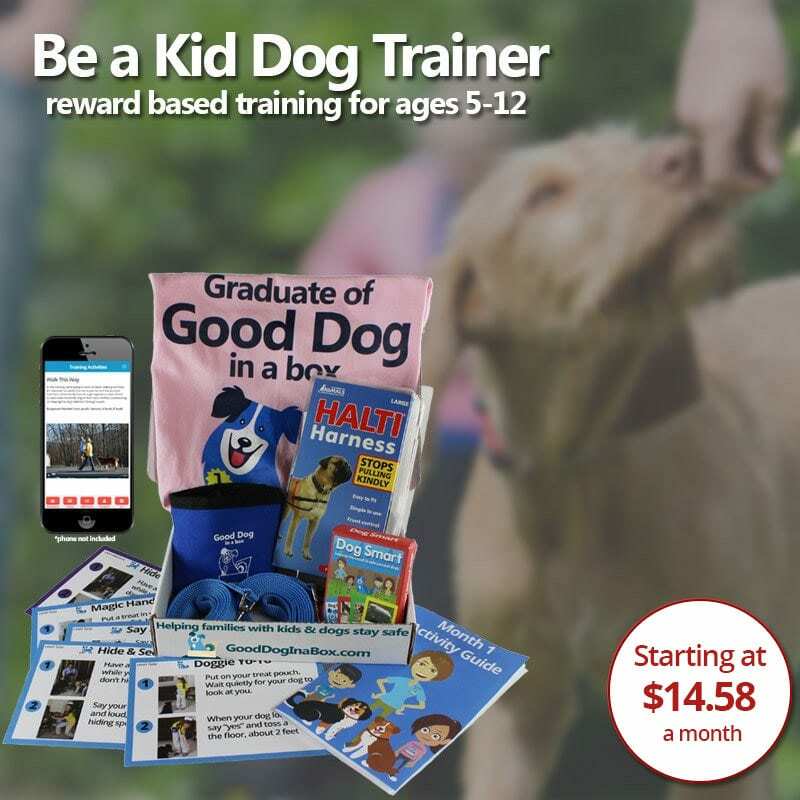 Children find dogs fascinating and want to interact with them at every given opportunity. Your dog needs space, especially when they are eating and sleeping. 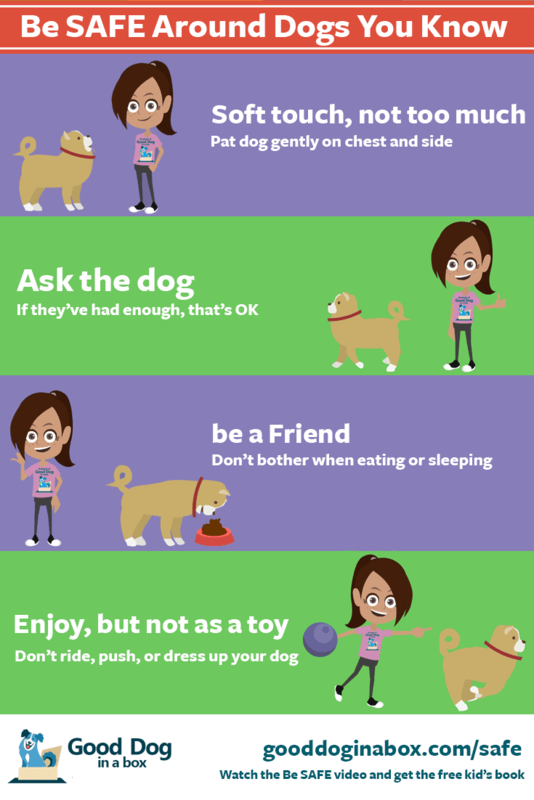 Make these times off limits for your children to interact with the dog. Dogs aren’t toys. Parents sometimes let their guard down if they have a tolerant dog that allows children to poke, prod, dress up and climb on them. Just because your dog tolerates it, does not make it appropriate, safe or fair to the dog or any animal. Dogs are not toys and if your child wants to play with the dog, parents need to create opportunities that both the dog and the child enjoy. 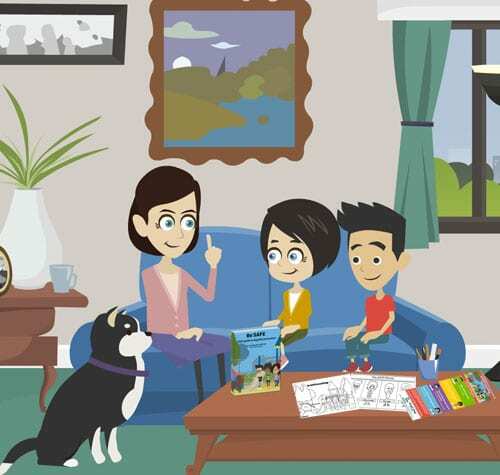 The SAFE game a great way to begin a conversation with your children about appropriate behaviors around dogs they are familiar with. As the adult, it’s important to remember that children will model your behavior around dogs. If you are rough with a dog, children who witness this interaction will repeat it. If you yell at your family dog, your children will yell at it to. A child is smaller and more vulnerable to bites and attacks from a dog, and the precipitating factors in a dog bite could simply be repeating negative behavior exhibited by an adult. And maybe not even an adult in your household. Be aware of the messages your child is learning from adults interacting with dogs. Teach your children our SAFE games. 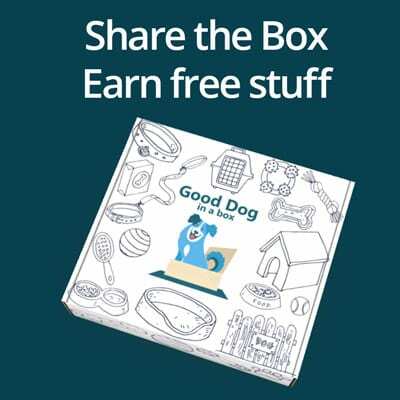 It’s easy, fun, and promotes safe behavior around dogs. 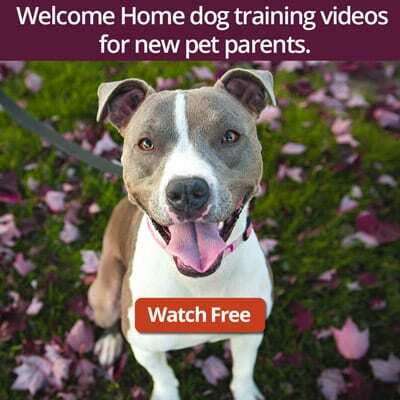 Help them learn about dog body language, stress signals, and how to be their dog’s friend. 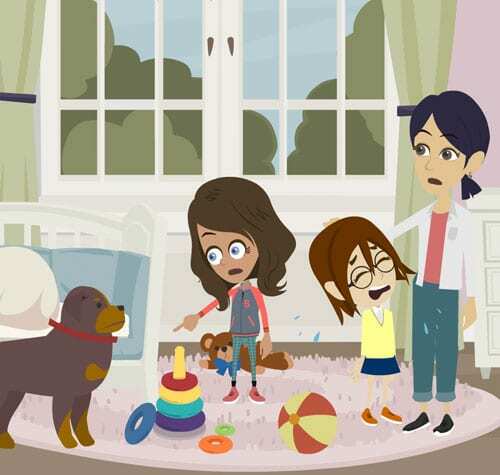 Actively supervise all interactions between your child and any dog. Just because your child is interacting with a dog they have met before or a dog they know well or even a dog they live with, don’t assume that you can slack off on your active adult supervision. That means your full attention and guidance at all times. 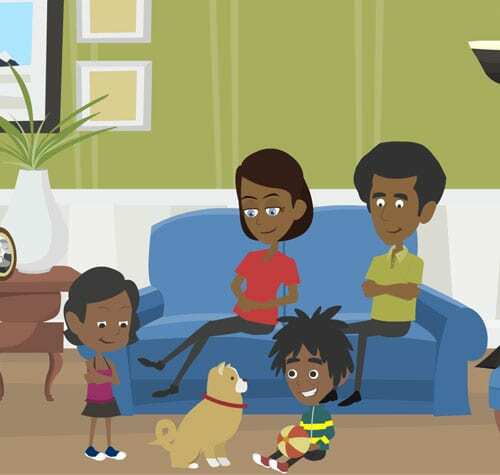 If you can’t provide your active supervision, then measures should be taken to separate dogs and children while you multi-task or leave the room. It is the adult’s responsibility to monitor not only the behavior of your child, but also the subtle signs of stress or discomfort that the dog may be displaying. What type of supervision are you providing? 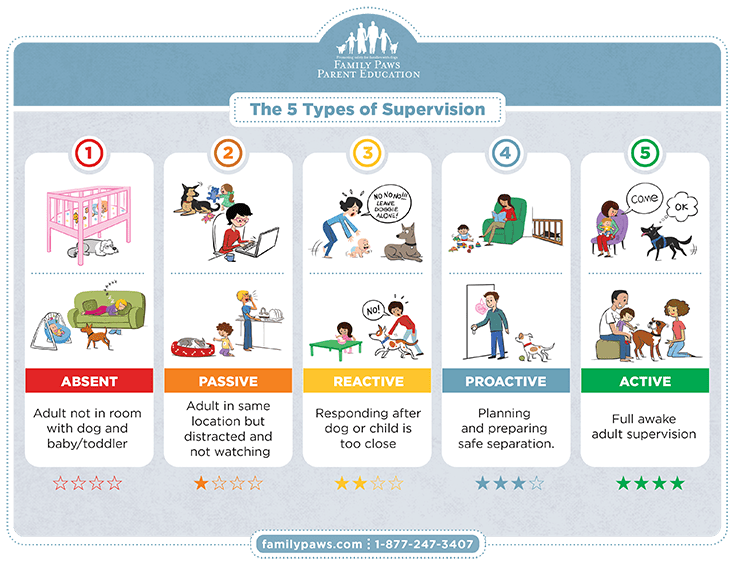 Here’s a handout from Family Paws Parent Education that illustrates 5 Types of Supervision.